This is just one segment of a 4400 mile National Scenic Trail. There are several hundred continuous off-road miles which can be hiked within the Manistee National Forest and northward. The trail continues southward in Mason County and to the north in Wexford County. Parts of this section are open to bicycles. Dispersed- Dispersed camping is allowed anywhere in the Manistee National Forest if you are 200 feet from the trail, or a water source, and 1/4 mile from a road or developed campsite. Private Landowner- There is a campsite for NCT hikers on private land along Cedar Creek Road. Blacksmith Bayou- Blacksmith Bayou Campground is a National Forest Campground on the Manistee River reached by a short trail very near the NCT. Campsites have picnic tables, fire rings with grates, latrine, water. Sawdust Hole- Sawdust Hole Campground is a National Forest Campground on the Pere Marquette River reached by a side trail just west of Dilling Rd. Campsites have picnic tables, fire rings with grates, latrine, water. Seaton Creek- Seaton Creek Campground is a National Forest Campground (actually just into Wexford County) reached by a side trail from south Beers Rd. Campsites have picnic tables, fire rings with grates, latrine, water. Description of this section is sketchy at this time, but begins at Nine-Mile Bridge, approximately the Mason / Manistee County line and proceeds north. Walk north on Scocelas Road over the Little Manistee River and turn east on Udell Hills Road in about 0.5 mile. Look left almost immediately for where the trail returns to the woods. You will now cut across this wooded corner. This portion has rolling ridges. Cross a 2-track and under a power line and in 0.5 mile re-cross the dirt corner of Scocelas and Good Roads. Turn north into the woods on the other side. Climb a long gentle slope, and then descend briefly into a badly eroded area and climb back out of this. Angle right on an old woods road, and then veer left into the woods. In about 0.75 mile, cross a 2-track. You are now circling the west edge of the Udell Hills and the Big M Ski Area. The NCT crosses bike trails and old service roads several times, finally joining one of the old roads for a short distance. Watch for a turn left into the woods off this, but it is well marked. Reach M-55 and the Udell Trailhead in about another 0.5 mile. Access- parking at Nine-Mile Bridge. for about 6 cars, information kiosk, fee site. Parking at Udell Trailhead for many cars, information kiosk, fee site. Restrictions- No horses or motorized vehicles. No camping within 200 feet of the trail. Distance and time- 6.1 miles, about 2.5 hours. Trail Markers- blue rectangular painted blazes (some blue diamonds remain). Condition of Marking- adequate- treadway is slightly sunken so should be able to be seen even with fresh snow. Treadway- packed sandy forest soil. Grades- flat to rolling with only a few short sections which could be called moderately steep. Description of most of this section is sketchy at this time, but begins at M-55 (Udell Trailhead) and proceeds north. Cross M-55 and enter the woods, but emerge shortly on Huff Road to cross Pine Creek. Continue north on Huff to Cedar Creek Road (dirt) and turn right (east). This angles southeast and in about 1 mile turn left (north) on Michigan Avenue (dirt). Take this north for just over a mile to Chicago Avenue (dirt). Turn right and watch for where the trail returns to the woods on the north side of the road in about 0.3 miles. There are now 1.7 miles till you reach Highbridge, but within that stretch you pass Blacksmith Bayou Campground on the banks of the Manistee River. There is a flyer you can get at the Manistee Ranger Station for interpretive stations between Blacksmith Bayou and Highbridge. Angle into Highbridge Road from the southwest. Cross the road and there is a pedestrian walkway on the east side of the road. Highbridge parking is on the northwest side of the bridge. There are latrines there. Access- Parking at Udell Trailhead on M-55 for many cars, information kiosk, fee site. Parking at Highbridge for many cars, fee site. Limited free parking on SW side of Highbridge. Restrictions- No horses or motorized vehicles. No camping within 200 feet of the trail, no bicycles Udell (M-55) to Dilling Rd. Distance and time- 5.9 miles, about 2 hours. Grades- flat to moderate with a few sections which could be called moderately steep. Segment 3 (Highbridge to Upper River Road Trailhead) Closed to bicycles from Highbridge to Dilling Rd. The trail leaves Highbridge on Highbridge Road. In about 0.4 miles angle right on a dirt road/snowmobile trail and watch for a turn to the right for the NCT. Follow the top of a glacial esker- a unique geological feature. There are some good views in this section. 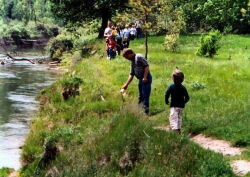 Descend on a series of switchbacks to river level in an area known as Leitch Bayou. Cross a section of beaver activity on a bridge. The beavers have built the dam right beside the bridge. Continue on low floodplain of the Manistee River. This area is popular with anglers. Cross four small bridges while you are at river level, and then reach some puncheon. Immediately after this you climb back to the bluff. The NCT turns left at the top of the bluff and quickly reach Dilling Road. If you continue straight instead of turning, for 1/4 mile you can reach Sawdust Hole Campground. Cross Dilling Road. Climb away from Dilling Road and cross a 2-track. Reach the top of the bluff, and begin a section with some ups and downs until you reach the bluff above Tippy Dam Pond when you will continue mostly along the contour. Side trail to "Far From the Maddening Crowd Knoll" - nice view. Down at river level cross 2 track near River Road where there is an unofficial campsite. Climb again to bluff; there are several nice views here. There is a steep side trail (0.4 mile) down to the parking at Upper River Road Trailhead. Access- Parking at Highbridge for many cars, fee site. Parking at Sawdust Hole for 2 or 3 cars. Parking at Upper River Road TH for several cars. Distance and time- 10.5 miles, about 4 hours. Condition of Marking- adequate, treadway is slightly sunken so should be able to be seen even with fresh snow. Description of this section is mostly sketchy at this time, but begins at Upper River Road and proceeds north. There is parking for several cars at Upper River Road Trailhead, and you will have a steep climb up to reach the main NCT. This section is the NCT half of the popular North Country / Manistee River Trails loop hike. This loop is about 20 total miles and makes a nice weekend backpack. The trail in this section is mostly on the bluff above the Manistee River with lots of good views. Turnoff to Marilla Trailhead. There is a bench on the spur to Marilla Trailhead with a nice view over the river valley. Reach the turnoff to the Suspension Bridge, Little Mac, the 2nd largest suspension bridge in Michigan! To reach Seaton Creek Campground, or the Manistee River Trail, cross the bridge. To continue north on the NCT, do not cross the bridge. Climb to join old railroad bed for the last mile before reaching Hodenpyl Dam parking. NCT continues along the road for a short distance to skirt private property, then returns to the shore of Hodenpyl Pond. Access- Parking at Upper River Road Trailhead, Marilla Trailhead, information kiosks, fee sites. Also parking at Hodenpyl Dam. Distance and time- 10+ miles (Upper River Road to Hodenpyl Dam, about 4 hours. Grades- flat to moderate with a few short sections which could be called moderately steep. Bicycling- The trail is open to bicycles south of Udell Trailhead, and north of Dilling Road. This means it is closed to bicycles from Udell to Dilling. Restrictions- All National Forest regulations apply. Many of the trailheads within the Manistee NF are now Recreation Fee Sites. This means you need a sticker to park there. There are self-pay tubes, see Huron Manistee National Forest fees for current price. No OHV's. 14-day camping limit. Other National Forest regulations apply. No camping along road. More- Visit the NCTA official web site The NCTA has full-color, topographic, field-checked maps of this section. Call 1-866-hikeNCT or use the ARCGIS online NCTA maps found at the web site. You can download the Forest Service Maps of the trail. They will no longer be putting these at the trailheads due to costs. Maintained by- Spirit of the Woods Chapter of the North Country Trail Association. Contact them to report problems or for more information on helping build and maintain trail. Nine-mile Bridge Public Access and parking can be reached by driving east on Freesoil Road. Five miles east of Freesoil, turn north on Campbell Rd, a good, graded dirt road. Continue for 5 miles and cross Riverside Drive. The road becomes Scocelas Rd (now in Manistee County). Just 1/10 mile farther the Public Access is on the left, before crossing the bridge. Or from Manistee go east on M-55 for 8 miles, and turn south on dirt Scocelas Rd. After several twists and turns this reaches Nine-mile Bridge. Udell Trailhead- Located on M-55 12 miles east of Manistee or 14 miles west of M-37, on the south side of the road. Blacksmith Bayou- On M-55 east of Manistee go to Highbridge Road. (15 miles east of Manistee, and 9 miles west of M-37) Turn north on Highbridge, and in 2 miles turn left on Chicago Ave., then watch for the sign to turn right into Blacksmith Bayou. The trail crosses the road before you reach the campground. Highbridge- On M-55 east of Manistee go to Highbridge Road. 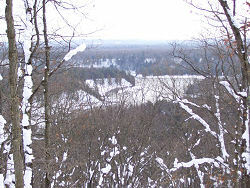 (15 miles east of Manistee, and 9 miles west of M-37) Turn north on Highbridge and you will come to the bridge in 3 miles. The main, paved parking area is on the northwest side of the bridge, but there is also a dirt area where you can park on the southwest side. Sawdust Hole- On M-55 east of Manistee go to Highbridge Road. (15 miles east of Manistee, and 9 miles west of M-37) Turn north on Highbridge, and go to Brethren. Turn east on Coates Highway, and 3.5 miles turn south on Tippy Dam Road. In about 2.5 miles turn right on a dirt road to Sawdust Hole. Before you reach the campground there is a dirt area for 2 or 3 cars to park just where you reach the bluff edge. The NCT is reached by a spur trail which follows the bluff straight out from the front of this parking area. There is also paved parking at the end of Tippy Dam Road. Marilla Trailhead- From M-55 go to Highbridge Road. (15 miles east of Manistee, and 9 miles west of M-37) Turn north on Highbridge and go to Kaleva. Turn east on 9-Mile Road. The pavement will jog north, and then east again on Beers Road. The Marilla Trailhead is 2 miles east of this jog, on the south side of the road. Or from M-37, go to Mesick and turn west on M-115. Just under 2 miles west of town, turn south on Hodenpyl Dam Road. The Trailhead is in 5 miles on the south side of the road. Hodenpyl Dam parking- Off Hodenpyl Dam Road/Beers Road 3 miles west of Mesick. Turn south on Blueberry, and parking is the right.